Momentum to prohibit weapons that would select and attack targets without further human intervention is building rapidly while a multilateral process to discuss the weapons proceeds, but at a lacklustre pace. On Friday, 15 April, states attending the CCW meeting on lethal autonomous weapons systems (another term for killer robots) agreed by consensus to recommend that deliberations on the topic continue with the formation of an open-ended Group of Governmental Experts. States will consider and–if there is consensus–formally adopt this recommendation at the CCW’s Fifth Review Conference on 16 December 2016. While it is still to be confirmed by the Review Conference, the Group of Governmental Experts is expected to meet for approximately six weeks over 2017 and 2018 to explore and agree on “possible recommendations on options” for addressing lethal autonomous weapons systems. A total of 94 states (82 high contracting parties, one signatory, and 11 non-signatories) attended the week-long “informal meeting of experts” on lethal autonomous weapons systems at the United Nations this week, which is an increase from 90 states at the previous week-long meeting in April 2015 and 87 countries at the first meeting on the topic held in May 2014. As was the case at the two previous meeting, the need for meaningful human control of weapons systems was a central feature of the meeting, raised throughout by multiple states, expert presenters, the ICRC and the Campaign to Stop Killer Robots. Other formulations relating to human control were proposed, including by the US, which expressed its preference for “appropriate levels of human judgment.” But after three years the notion of human control over weapons systems remains at the heart of this international debate. * The 14 states calling for a preemptive ban on fully autonomous weapons are Algeria, Bolivia, Chile, Costa Rica, Cuba, Ecuador, Egypt, Ghana, Holy See, Mexico, Nicaragua, Pakistan, State of Palestine, and Zimbabwe. 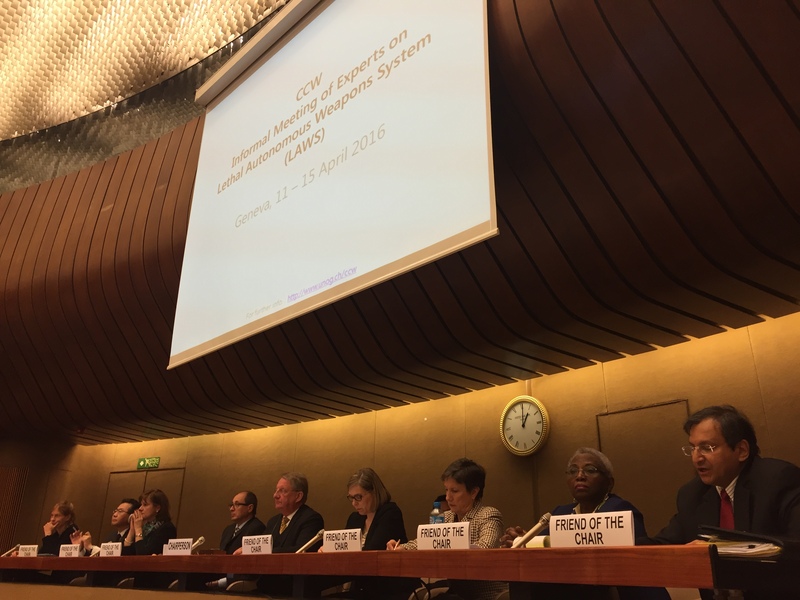 UPDATE: See the campaign’s Report on Activities at the third CCW experts meeting.